Above is an animation of the visible imagery of Irene (click on the image to animate). As you see, the storm is much better organized today as it moves over the Southeastern Bahamas. I know the Turks and Caicos took a beating last night, but the eye never made landfall and the eyewall stayed far enough offshore to prevent the highest winds from affecting them. Gusts did approach 107 mph and very heavy rain was experienced. Irene just wobbled over the Crooked and Acklins Islands in the last hour as a Category 3 hurricane with winds of 115 mph. The hurricane continues to look organized and additional strengthening is becoming likely before an eyewall replacement cycle in about 36-48 hours, if not sooner. 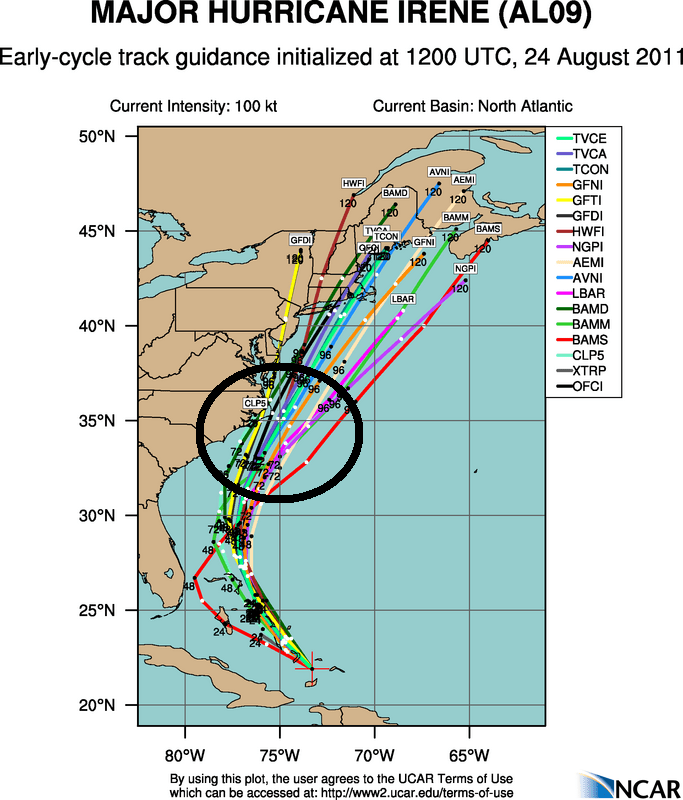 12z track guidance for Irene on 08/24/11. The 12z track guidance continues to shift slightly east, but that could be due to the model forecasted strength of an upstream shortwave trough moving towards the Great Lakes. I am starting to think the western edge of guidance is more believable. As you can see, I circled the 72 and 96 hour window which you can compare to the circle on the 12z intensity guidance to highlight how strong the models think Irene will be at its closest approach to Cape Hatteras. I see no reason to dismiss these ideas of a strong CAT 2 or CAT 3 hurricane affecting eastern NC. So, why am I troubled by the eventual path? The water vapor image above shows Hurricane Irene outlined in red (1) with two subtle upper-level features that could play a role in the short-term track of the storm. The yellow circle highlights a weak upper-low/shortwave that is backing southwest towards the Gulf of Mexico. This is providing light shear out of the west which the hurricane is currently fighting off, though the outflow pattern is restricted. The green circle shows a second upper-level low/shortwave that is hung up on the NC coastline. I am not certain how this feature will affect the path, but it does supply a weakness in the subtropical ridge, better known as the Bermuda High. Now, Irene is getting stronger which typically promotes a stronger ridge to the north and east of the storm through subsidence (air descending on the periphery of the storm). I know, I know. . .what does that mean in English? It means the hurricane can produce its own local environment, which models can’t forecast well and thus lead to a rightward bias in the forecast tracks. (I’ll get to the two invest areas in the Atlantic at the end of this post). So, I thought I would show you the 12z GFS forecasted surface, 500 mb (about 6000 m), and 200 mb (much higher than 500 mb) plots. 96 hour forecast from the 12z GFS valid at 12z or 8 am EDT on 08/28/11. The surface pressure and precipitation plots above show the GFS forecast for Irene valid at 5 pm EDT on 08/27/11 and 8 am EDT on 08/28/11. The first image shows the closest approach to the Outer Banks as a 972 mb hurricane or roughtly CAT 2 winds. 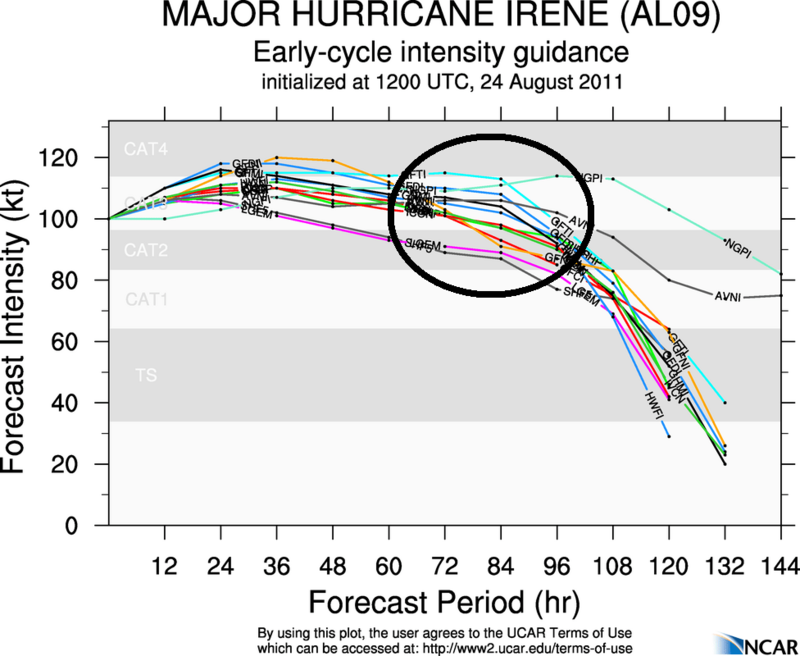 The second image shows Irene southeast of Atlantic City as a 967 mb or roughtly CAT2/CAT3 hurricane. This is a subtle shift (~30 miles) west of the 06z GFS run. I think we will still see an adjustment west of the track in the coming model solutions. Here is why. . . The 500 mb plots valid at the same times as the surface plots show how the mid to upper-level pattern will evolve (based on the GFS of course). The red lines depict the trough axes while the green lines depict the ridge axes. At 81 hours, the trough has one axis which is rather shallow and in 96 hours it has moved north of the hurricane, while a second trough axis develops to the west. This could be too fast and a slower progression would allow the hurricane to hug the coast more than is currently predicted. The ridge axis holds to the northeast of the hurricane, preventing a recurvature away from New England. At 200 mb, the 96 hour forecast shows a similar dual trough axis depiction, but again, it is not very deep. This leads me to believe that the hurricane will be closer to the coastal areas. Climatology doesn’t have many storms to pick from in Irene’s current location, which makes the forecast that much tougher. Storms that come to mind that created havoc on the East Coast are Bob (1991), Floyd (1999), Gloria (1985), the 1944 hurricane and a storm in 1821. All of those had serious impacts on the Mid-Atlantic and Northeast. If we were in September or October, I would buy the quick-out-to-sea approach, but I think anyone from Charleston, SC to Boston, MA should continue to prepare for impacts. Rainfall impacts may need to be nudged a bit inland from current ideas, but we will wait to see how the forecast tracks change (or stay the same). The GFS output is predicting between 5″-10″ of rain from coastal NC up through coastal NJ with over 12″ expected in southern New England (beyond this time frame). Wind impacts on the GFS path would be in the tropical storm range in the Mid-Atlantic with hurricane conditions for the Outer Banks, Eastern Long Island, RI, and MA. I wish I could show the European images as the storm is closer to the Mid-Atlantic which would increase the storm surge, rainfall, and wind impacts for coast Delmarva, NJ, and into NYC. If you are reading this from Wilmington up through NYC, I would keep in mind that track errors could be on the order of 200 miles within 96 hours. I’ll update when the new Euro is available. As for the rest of the tropics. 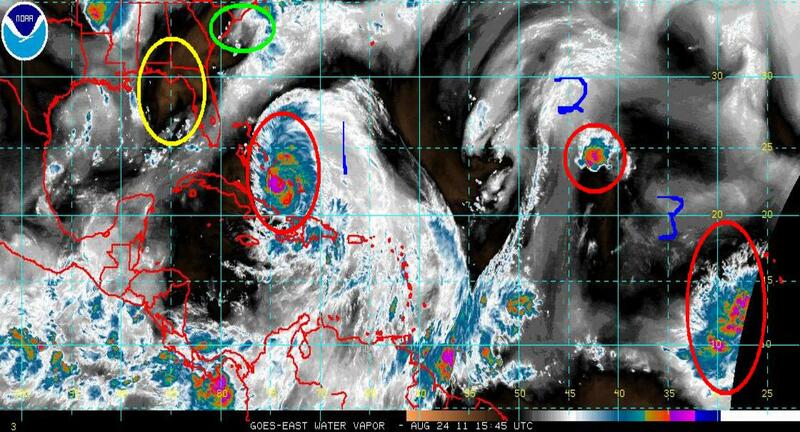 The two invest areas I circled in red on the WV image above need to be watched for possible development. The northern one (2) is no threat, but the southern one (3) will be interesting to monitor. That’s all I have for now. If you are interested in subscribing to this blog, leave a comment and click on the box that says “Notify me of new posts via email.” If you have any specific questions or concerns, feel free to send me a message. Thanks for reading! Always look forward to your analysis!